In the heart of the Prosecco Wine Region, Villa Valentina sits on 7 acres of vineyards and 3 acres of orchards, olive trees and wooded lands, the view is specatcular. This home is for entertaining and for those that love to stay home and relax. Two charming and authentic villages are just under 1 mile, and the town of Conegliano is just 6 miles. A casual restaurant is within walking distance. Venice is under 45 minutes and can be reached by train. Or spend the day in the Italian Alps, the Dolomites for a great outdoor adventure. .
Off of a blacktop road, you enter through the private gate into your parking area. From the parking lot, the entrance leads you into a foyer , ahead of you is the staircase to the first floor. On your right, a guest bathroom and then the entrance into the open concept living area, a large spacious dining room to your right and a cozy yet large living room with comfortable upholstered sofas centered cozily around the fireplace. Beyond the living room is the kitchen with a small table and chairs ideal as a breakfast nook. From the foyer, the staircase takes you up to the first floor. On your left is a double bedroom with en suite bath. On your right a single bedroom with en suite bathroom. To the front of the house are 2 additional queen bedrooms with en suite bathrooms. At the end of the hallway is a study / living room . Only from this room can you reach the SECOND FLOOR master bedroom with en suite bathroom. Back in the foyer, the staircase continues to the Second Floor. There is a queen bedroom with en suite bathroom and a smaller double bedroom with a hall bathroom. From this floor you cannot access the Master Bedroom on this floor, it can only be reached from a staircase in the second floor study/living room. From the dining/ living room are doors leading out to a super large terrace covered with an equally large open wooden roof. Under this wooden roof is an amazing outdoor kitchen with a marble countertop and sink, a six burner gas stove top and a large stainless steel grill. On this terrace is a large wooden table that can comfortably seat 16 guests. The heated infinity pool and Jacuzzi runs the length of the terrace. The short side of the terrace abuts a large parquet patterned wood deck that wraps around part of the short side of the swimming pool and continues back towards and beyond the pool house offering a large spacious area with views over the prosecco vineyards . 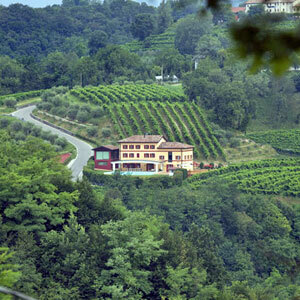 Beautiful views of the surrounding vineyards which produce the wonderful Prosecco wines that you can buy from the owner. The Italian government has implemented an Accommodation Tax . The amount varies by municipality and ranges from E 1.50 – E 5.00 per person, per day and applies to all overnight stays for the first seven to ten days. This tax is payable to the local property manager in cash euro.